I was having a party and wanted to make a few different kinds of mini cupcakes. Since I had already found amazingly delicious recipes for chocolate and vanilla cupcakes, I decided to give this peanut butter recipe a shot. My guests loved it; I thought it was just okay. Then again, I’m not a fan of nuts in baked goods, and this recipe calls for crunchy peanut butter. I think if I were try it again, I’d use smooth. Anyway, the cake definitely has a peanut butter flavor, but it’s not overwhelming and the chocolate frosting compliments it quite well. Prehead oven to 350 degrees and line muffin pan with paper liners. In a small bowl, mix together flour, baking powerder and salt. In a large bowl, using an electric mixer, beat together granulated and brown sugars and butter until well combined. Add peanut butter, beating until smooth. Add egg and vanilla, beating well. Alternately beat in flour mixture and milk, making three additions of flour mixture and two of milk, beating until smooth. Scoop batter into prepared pan. 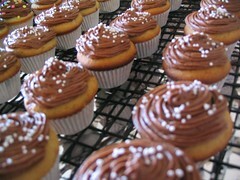 Bake in preheated oven for 20 to 25 minutes or until tops of cupcakes spring back when lightly touched. Let cool in pan on rack for 10 minutes. Remove from pan and let cool completely on rack. Top cooled cupcakes with frosting. Notes: I used mini cupcake tins so I ended up with about 36 cupcakes. Also, I used this chocolate buttercream recipe. I made these and there were really, really good.